The Offset date/time building block is used to offset a date/time value with any number of years, months, days, hours, minutes or seconds. For instance, if the original date/time value was 01.01.2017 10:00:05 and the offset value is 1 year and 2 minutes with the “Add” offset method, the result date/time would be 01.01.2018 10:02:05. There are no green input or output connectors in the header, because this building block is never explicitly executed. Rather, it is used to change (offset) a date/time value and deliver the result to other building blocks. The title of the block (“Offset date/time”) can be changed by double-clicking on it and typing in a new title. The original date/time value to change. This can either be entered as separate date and time values (and again be separated out into year, month, day and hour, minute, second values). The offset value, which can be entered as separate date and time values (and again be separated out into year, month, day and hour, minute, second values). Add: Add the individual offset field values to the original date/time value. Subtract: Subtract the individual offset field values from the original date/time value. Set: Set any individual part of the original date/time value to a specific value, for instance specify the year to be 2020. 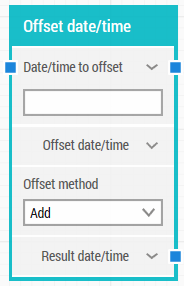 The result date/time value after the offset operation.